The house is located in Baabdat, a 30 minute drive from the center of the city using the new high speed road leading to the quaint village up in the mountain. Its geometry responds to both the spectacular 180 degrees views of the mountains and the car drop-off access to the house in a series of land cuts that create an architecture tucked below the landscape. 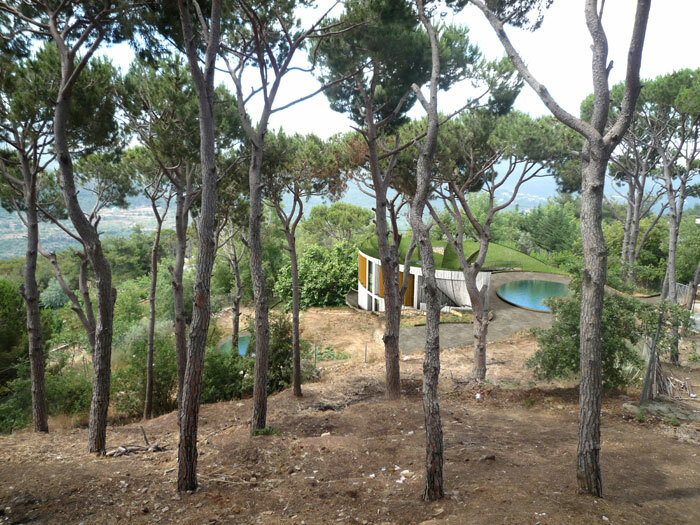 A simple sculptural move and landscape incision, the house becomes through its geometry and its generative process a hybrid inhabited land form. Its form is directly generated as an extension of this transit car experience, collapsing the exterme experiences of a highway and a house, and creating an inversion of the traditional agricultural terracing which opens the house towards the views of the adjacent mountains.